Similar to data from academic screening tools, data from universal behavior screening tools can be used in tiered systems of support to (a) detect students for whom Tier 1 efforts may be insufficient, (b) inform teacher-delivered, low intensity supports, and (c) connect students with evidenced-based Tier 2 (for some) and Tier 3 (for a few) strategies, practices, and programs. Watch more videos about systematic screening, screening logistics, and screening protocols. 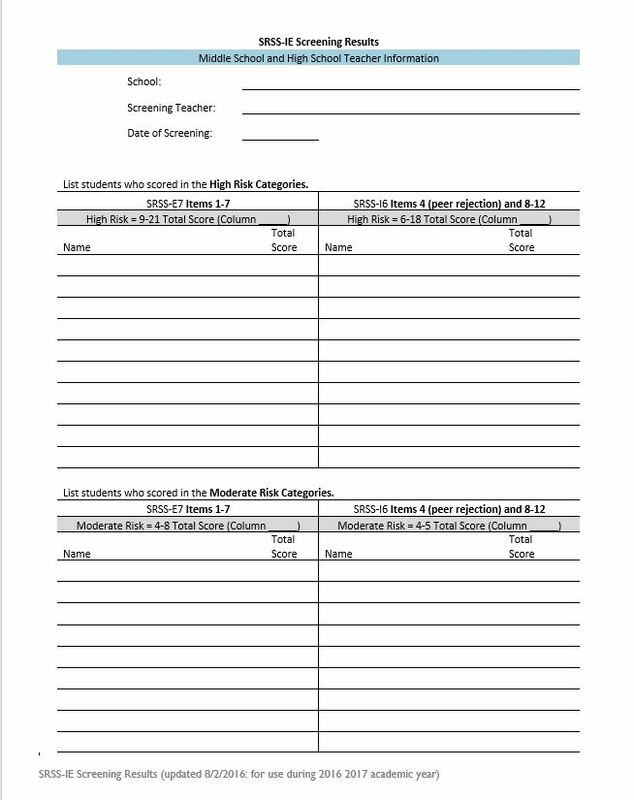 The STUDENT RISK SCREENING SCALE (SRSS) is a free-access tool, originally developed to detect elementary students at risk of anti-social behavior patterns (Drummond, 1994). Students are individually rated on seven items using a 4-point Likert-type scale: never = 0, occasionally = 1, sometimes = 2, frequently = 3. These items are: (1) steal; (2) lie, cheat, sneak; (3) behavior problem; (4) peer rejection; (5) low academic achievement; (6) negative attitude; and (7) aggressive behavior. Once the items are summed for each student, the student’s total score falls into one of three categories of risk: low (0-3), moderate (4-8), or high (9-21). Supports (secondary, tertiary) are considered for students based on the category of their individual score. Students in the moderate or high risk categories should be considered by educators for additional supports and interventions at the school-site. Additionally, aggregated SRSS data can be utilized to monitor the level of risk over time within grade levels, school buildings, or a district (Lane, Kalberg, Bruhn, Mahoney, & Driscoll, 2008). Since its initial development, the SRSS has been validated for use at the elementary (e.g., Drummond, Eddy, & Reid, 1998), middle (Lane, Parks, Kalberg, & Carter, 2007) and high (Lane, Kalberg, Parks, & Carter, 2008; Lane, Oakes, Ennis, Cox, Schatschneider, & Lambert, 2013) school levels. Furthermore, this screening tool has been found to be socially valid (e.g., Lane, Bruhn, Eisner, & Kalberg, 2010) and psychometrically sound (Lane, Little, et al., 2009). Specifically, Lane, Little, et al., (2009) found the SRSS total scores improved chance estimates by 45% for detecting students with externalizing (e.g., aggressive, noncompliant) behavior patterns and 30% for detecting students with internalizing (e.g., anxious, socially withdrawn) behavior patterns. The SRSS has been used widely in studies to (a) determine the responsiveness of students within the context of multi-tiered models of prevention, (b) illustrate how a school’s risk shifts over time, and (c) to identify students in need of secondary (Tier 2) or tertiary (Tier 3) supports. For more information, examples, and a voiced-over PowerPoint presentation by Kathleen Lane, visit Michigan’s integrated behavior and learning support initiative site. The Student Risk Screening Scale – Internalizing and Externalizing (SRSS-IE) – is an adapted version of the SRSS (Drummond, 1994) and is available free-access. The SRSS-IE modifies the original 7-item SRSS with the inclusion of 5 new items characteristics of internalizing behaviors. The SRSS-IE includes the original seven items and the new five items with all items rated on the same 4-point Likert-type scale: never = 0, occasionally = 1, sometimes = 2, frequently = 3. For more information on the new secondary level (middle and high school) preliminary cut scores, please consider reading the SRSS-IE MS HS Brief. Items include the original 7 items (1) steal; (2) lie, cheat, sneak; (3) behavior problem; (4) peer rejection; (5) low academic achievement; (6) negative attitude; and (7) aggressive behavior, and newly added and retained items (8) emotionally flat; (9) shy, withdrawn; (10) sad, depressed; (11) anxious; and (12) lonely. We encourage you to read the following articles to learn more about how to use the SRSS-IE at elementary as well as middle and high schools. Note. The following preliminary cut scores are now available for the SRSS-I (elementary: SRSS-I5, middle and high: SRSS-I6). Please note the item peer rejection is included in the SRSS-E7 and SRSS-I6 when used at the middle and high school level. The two subscale scores are used for decision making. Lane, K. L., Oakes, W. P., Swogger, E. D., Schatschneider, C., Menzies, H., M., & Sanchez, J. (2015). Student risk screening scale for internalizing and externalizing behaviors: Preliminary cut scores to support data-informed decision making. Behavioral Disorders, 40, 159-170. School level teams use these scores along with other school-collected data (e.g., curriculum-based measures of reading, math, and writing; course failures; office discipline referrals; attendance patterns) to inform instruction and make decisions regarding student needs for more intensive supports (i.e., Tier 2 or Tier 3; see Lane, Oakes, Ennis & Hirsh, 2014). Download the SRSS-IE in MS-Excel format. Note: This file contains 3 tabs, one for elementary schools, one for middle/high schools, and one containing important notes. The BEHAVIOR ASSESSMENT SYSTEM FOR CHILDREN 2ND EDITION: BEHAVIORAL & EMOTIONAL SCREENING SYSTEM (BASC-3: BESS; Kamphaus & Reynolds, 2007) is a brief, universal screening system for measuring behavioral and emotional strengths and weaknesses in children and adolescents preK-12 in a reliable, quick, systematic way. Forms can be scored by hand or completed as part of AIMSweb assessment and data management system. The BASC-2: BESS was designed to identify kids with behavioral or emotional patterns that impact academic achievement or social relationships. Keeping in mind that students behave differently for different people and in different settings or contexts, the BASC-3: BESS relies on multiple informants (teacher, parent, student) to obtain a comprehensive understanding of student strengths and weaknesses. Behavioral areas assessed include (a) Internalizing problems, (b) Externalizing problems, (c) School problems, and (d) Adaptive skills. The BASC-3: BESS includes three forms that can be used individually or in combination (Spanish-language versions available for parent and student forms): (a) Teacher: Preschool and Child/Adolescent, (b) Student self-report: Child/Adolescent, and (c) Parent: Preschool and Child/Adolescent. 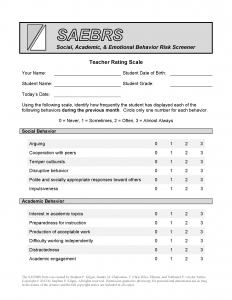 The SOCIAL, ACADEMIC, & EMOTIONAL BEHAVIOR RISK SCREENER (SAEBRS; Kilgus, Chafouleas, Riley-Tillman, & von der Embse, 2013) is a brief (1-3 minutes per student) universal screening tool for behavioral and emotional risk designed for use across the K-12 grade span. The measure consists of 19 items divided between 3 scales: social behavior (6 items), academic behavior (6 items), emotional behavior (7 items). Research suggests the SAEBRS may be used to evaluate overall general behavior, as assessed by the total of the items Total Behavior (19 items). Raters identify how frequently the student has displayed behaviors during the previous month using the following 4-point Likert-type scale: 0 = Never, 1 = Sometimes, 2 = Often, 3 = Almost Always. Prior to scoring, negatively worded items are reversed scored. For more information, please consider reading the SAEBRS brief or review the provided PowerPoint Show. The SDQ considers input from multiple stakeholders, seeking teacher, parent, and student perspectives to assess a given individual’s behavioral performance (Lane, Menzies, Oakes, & Kalberg, 2012). The SYSTEMATIC SCREENING FOR BEHAVIOR DISORDERS (SSBD; Walker, Severson, & Feil, 2014) 2nd edition is validated for grades PK-9 and a widely used multi-gated universal screening tool designed to find students who have either internalizing or externalizing patterns of behavior. Many consider the SSBD to be the “gold standard” in screening. This teacher completed tool has three stages: (1) nomination and rank ordering, (2) behavior scales, and (3 optional for universal screening purposes) the School Archival Records Search (SARS) and direct observations of student behavior (classroom and playground). With the updated 2014 2nd edition, screening with the SSBD is available online or in a paper format. Screening a class of students takes less than one hour to complete. In stage one, the classroom teacher considers all students’ behavior patterns using the descriptions of internalizing and externalizing behavior dimensions, selecting the three students with behaviors most like the each description. These six students (three for externalizing and three for internalizing) pass through Gate 1 on to stage two. In stage two, the six students are then rated by the teacher on behavior scales: Critical Events Index and Combined Frequency Index of Adaptive and Maladaptive Behavior. Students who exceed normative criteria on these two indices pass through Gate 2 on to stage three. In stage 3, a trained professional directly observes students in an instructional settings (academic engaged time) and on the playground (positive social behavior). The preschool scales (Early Screening Project, ESP) vary slightly in terms of behavior scales and observation setting. The SOCIAL SKILLS IMPROVEMENT SYSTEM – PERFORMANCE SCREENING GUIDE (SSiS-PSG; Elliott & Gresham, 2008) is an efficient screening tool for Preschool-Secondary. The SSiS–PSG is one tool in a family of products for screening, assessment, instruction, and intervention. The SSiS-PSG screens four skill domains: Prosocial Behavior, Motivation to Learn, Reading Skills, and Math Skills. Educators rate each student’s skills using a 5-level descriptive criterion. Educators are able to quickly assess results corresponding to the color band for each domain – green band indicating the student is at or above expected levels of functioning for their age, yellow band indicating moderate concern, and red band indicating a high level of concern. 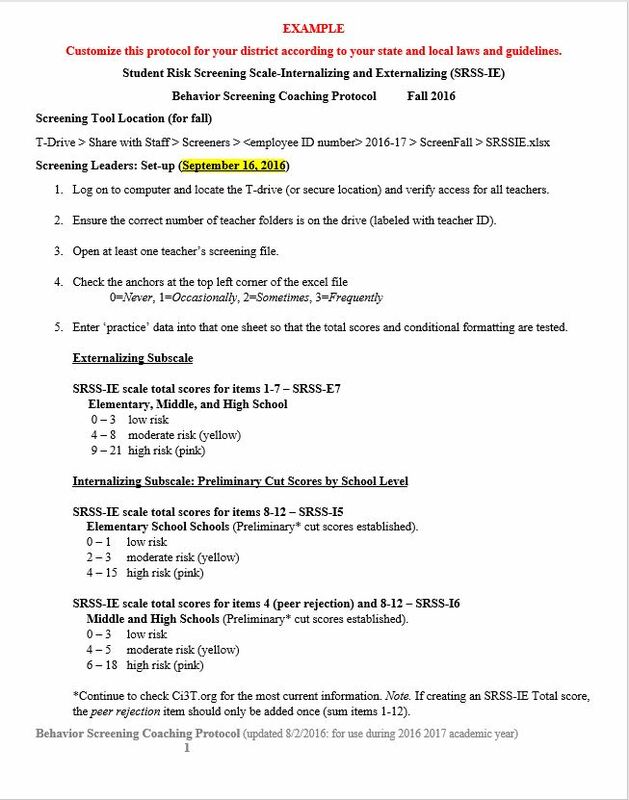 Then educators list, on the last page of the screening tool, the students in each of the yellow and red risk band and determine appropriate interventions with the support of their school teams. • Download MS-Excel format (53 KB) Note: This file contains 3 tabs, one for elementary schools, one for middle/high schools, and one containing important notes. • The SRSS-IE retains the original 7 items of the SRSS (Drummond, 1994). For more information on the SRSS, examples, and a voiced-over PowerPoint presentation by Kathleen Lane, please visit Michigan's integrated behavior and learning support initiative site. • Please exercise caution when using the preliminary cutting scores for internalizing behaviors. Please review currently available information to guide your implementation decisions. 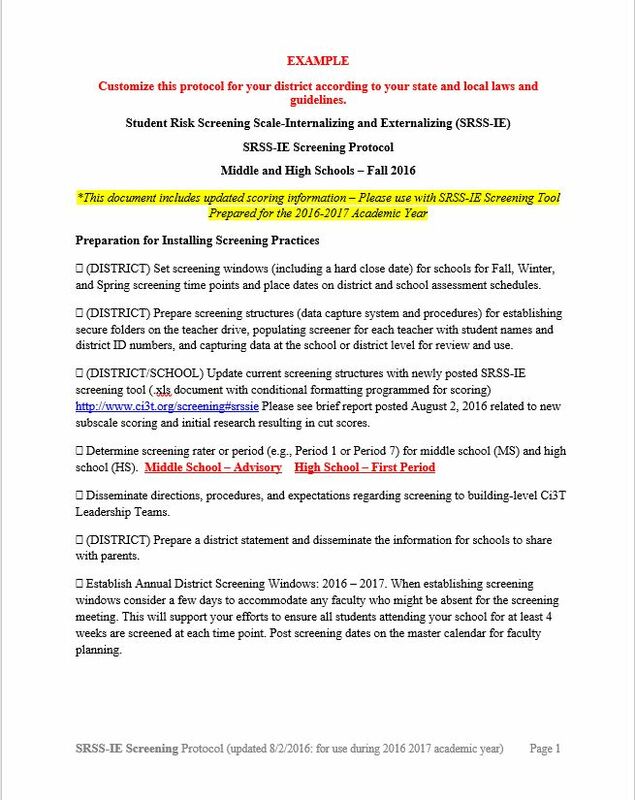 For more information on the new secondary level (middle and high school) preliminary cut scores, please consider reading the SRSS-IE MS HS Brief. 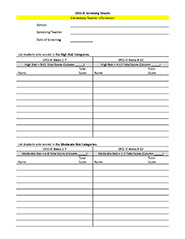 Educators may use this sheet to record student names and SRSS-IE scores in the moderate and high-risk categories. Note: the moderate and high-risk category score ranges in this document for the internalizing subscale (Items 8-12) are only applicable to ELEMENTARY students. Educators may use this sheet to record student names and SRSS-IE scores in the moderate and high-risk categories. Note: the moderate and high-risk category score ranges in this document for the internalizing subscale (Items 8-12) are only applicable to MIDDLE AND HIGH SCHOOL students. Walker, H. M., & Severson, H. H. (1995). The Early Screening Project for young children with behavior problems: Research and development of the early screening project. Journal of Emotional and Behavioral Disorders, 3(4), 194-202. Lane, K. L. (2002). Primary Prevention Plan: Feedback Form. Unpublished rating scale.Lane, K. L. (2009a). Teacher self-report form. Unpublished instrument. Lane, K. L. (2009b). 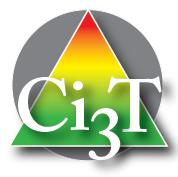 CI3T treatment integrity: Direct observation tool. Unpublished instrument. Lane, K. L., Kalberg, J. R., Bruhn, A. L., Driscoll, S. A., Wehby, J. H., & Elliott, S. (2009). Assessing social validity of school-wide positive behavior support plans: Evidence for the reliability and structure of the Primary Intervention Rating Scale. School Psychology Review, 38, 135-144. Lane, K. L., Kalberg, J. R., Bruhn, A. L., Mahoney, M. E., & Driscoll, S. A. (2008). Primary Prevention Programs at the Elementary Level: Issues of Treatment Integrity, Systematic Screening, and Reinforcement. Journal of Education and Treatment of Children. 31, 466-494. Lane, K. L., Little, M. A., Casey, A. M., Lambert, W., Wehby, J., Weisenbach, J. L., & Phillips, A. (2009). A comparison of systematic screening tools for emotional and behavioral disorders. Journal of Emotional and Behavioral Disorders, 17(2), 93-105. DOI: 10.1177/1063426608326203. Lane, K. L., Oakes, W. P., Common, E. A., Zorigian, K., Brunsting, N. C., & Schatschneider, C. (2014). A comparison between SRSS-IE and SSiS-PSG scores: Examining convergent validity. Assessment for Effective Intervention, 1-13. doi: 10.1177/1534508414560346. Lane, K. L., Oakes, W. P., Ennis, R. P., & Hirsch, S. E. (2014). Identifying students for secondary and tertiary prevention efforts: How do we determine which students have Tier 2 and Tier 3 needs?Preventing School Failure, 58, 171-182. Lane, K. L., Oakes, W. P., Harris, P. J., Menzies, H. M., Cox, M., & Lambert, W. (2012). Initial evidence for the reliability and validity of the student risk screening scale for internalizing and externalizing behaviors at the elementary level. Behavioral Disorders, 99-122. Lane, K. L., Oakes, W. P., Swogger, E. D., Schatschneider, C., Menzies, H., M., & Sanchez, J. (2014). Student risk screening scale for internalizing and externalizing behaviors: Preliminary cut scores to support data-informed decision making. Behavioral Disorders. Lane, K. L., Robertson, E. J., & Wehby, J. H. (2002). Primary Intervention Rating Scale. Unpublished rating scale. Lynass, L., Tsai, S., Richmond, T., & Cheney, D. (2012). Social expectations and behavioral indicators in schoolwide positive behavior supports: A national study of behavior matrices. Journal of Positive Behavior Interventions, 14, 153-161. Oakes, W.P., Lane, K.L., Jenkins, A., & Booker, B.B. (2013). Three-tiered models of prevention: Teacher efficacy and burnout. Education and Treatment of Children, 36(4), 95-126. Walker, H. M., Severson, H. H., & Feil, E. G. (2014). Systematic screening for behavior disorders (SSBD) technical manual: Universal screening for preK–9 (2nd ed.). Eugene, OR: Pacific Northwest Publishing.